‘Awakening’ debuted to listeners a little under 2 years ago, and while this song is taken directly from the single (with no re-working or even a re-recording), the song nevertheless is a great inclusion on this album, and is, by definition, a fun song. ‘Awakening’ is about something else that is different and unique, compared to anything that has been sung much before in Christian music- coffee. Its such a weird thing to sing about Jesus and coffee, and thus compare one to the other. Yet John does it; and does it well. Standing at only 2:48, this song that’s acoustic guitar driven, alongside his trademark enthusiastic voice, John invites us to drink from the Everlasting Father and delve deep into His Word, something that will give us the energy and kick far more than a coffee can do! ‘Epic’, originally recorded on his 2014 album Life is a Gift and again for his 2015 North American release under the album title Crazy Faith; ‘Epic’ is re-recorded again with a few lyrics tweaked here and there, but virtually the same compared to the previous two versions. Nevertheless, ‘Epic’ as a song is another standout on the album, in a musical, lyrical and stylistic sense. We are reminded through the gang vocals and electric guitars that ‘…You are epic and glorious, awesome in power, galaxies sing majesty, holy is the King of Kings…’ A song that is as ready for the church to sing as the church is willing to give a song that is from left-field, ‘Epic’ is a song that I see the church taking hold of an singing congregationally in the future, declaring God’s epicness as a whole familial unit. The song itself primarily focuses on John’s drumming ability alongside his distinct voice, as John continues to draw upon personal experience for a fair amount of his songs, ‘Epic’ included. ‘Mama’s Prayers’ is about a mother’s constant love for her children, even if they are led astray in their lives for whatever reason, and the constant praying and hoping, that she will do, for God to intervene and bring them back home- while I don’t know if ‘Mama’s Prayers’ was in any way autobiographical, John nevertheless delivers this song with passion and poignancy, making this song one of the highlights on Explosions of Light. ‘Mine’ evokes a Matthew West-esque spoken story-and-song vibe as John himself divulges the meaning behind this heartfelt song- ‘…‘Mine’ is about my kids and the Father’s love for His children. The second verse literally talks about an incident where my 13-year-old daughter had a crush on and was texting with a 16-year-old boy. When I found out, I took that phone away. She doesn’t understand the reason I get all like Liam Neeson, but that’s a daddy’s love for his little girl…’; while ‘Comeback’ is a reminder that God is a God of all comebacks, and thematically, this new song by John alludes and harkens back, intentionally or not, to Danny Gokey’s song ‘The Comeback’, about similar themes and topics. Nevertheless, this song by John is very much autobiographical, as this album in particular came from a season of uncertainty and disillusionment. ‘When God Says No’ reminds me so much of the songs ‘Yes’ and ‘Because God is Good’ way back in 2011, as John now gives us hope and comfort in this song, that when God says no, for whatever reason, we must trust that God has a bigger ‘yes’ down the track, even if we may not see it now. 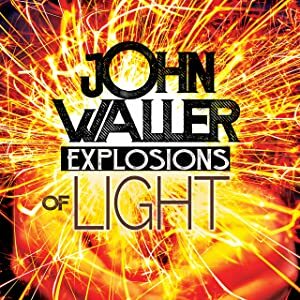 A song that feels like part 2 to these aforementioned songs, ‘When God Says No’ is arguably not just one of my favourites on Explosions of Light but one of my favourite John Waller songs…ever! ‘Good News’ features 7eventh Time Down frontman Mikey Howard as both John and Mikey thrive in this 3 minute duet- a song declaring God’s faithfulness, and that Him not leaving us, ever, is in fact, good news for everyone; while the album closes with piano prominent ‘Here’s My Yes’, a declaration by John to the Lord, declaring his devotion and servitude to the Lord, in light of what He has done for us. Though only piano (and a few string sections) to go with John’s passionate voice, the song itself is nevertheless a highlight. The oldest song (and hence the biggest standout on the album) is ‘I Choose You’, written by John and a few of his bandmates long time ago when John Waller was According To John (and then subsequently recorded by Point of Grace on their 2004 album). The song itself alludes to the fact that everyone worships something, whether they know it or not. The song boldly asserts that ‘…if everybody’s worshipping something, I choose You…’, a claim ought not to be sung lightly. Recorded in a light instrumentation vibe compared to the rousing atmosphere of Point of Grace’s version; John reminds us all, that often older songs are equally as poignant as newer ones. John Waller’s first album in 3 years is one of the most pleasant surprise albums within the last few weeks. Even though John started off as signed to a label, he is now currently one of my favourite indie artists, alongside others like Audrey Assad and Kerrie Roberts (both also previously on labels). With heartfelt lyrics and vertical praise moments to bring out congregational worship, John’s heart for worship, family, adoption, hope and Christ is all evident within these 11 songs. Still singing with his distinct southern gospel sound, it is the acoustic nature of some of these songs on the album, alongside the rousing anthemic numbers, that makes this album unique as John brings in many listeners who may listen to a variety of music genres and styles. Despite the lack of promotion (aside from a press release sometime in December 2018, this album has quickly risen to become one of my favourite albums released in January 2019 (alongside Switchfoot’s NATIVE TONGUE). Well done John for such an inspired and enjoyable album, and one that’ll hopefully encourage us all to live a life worthy of what Christ longs- to be an explosion of light to whoever we meet!